Landing pages matter, and making it clear where your business operates is particularly critical for small businesses trying to compete with national brands. A great local landing page should help your business make more money in two ways. Firstly, it should rank organically in search results. Secondly, it should convert page visitors into customers or leads. For example, last week I came home and I was hungry; so after a quick Google search I ended up landing on Domino’s Pizza, and the page tells me the following. “There’s a Domino’s 10 minutes away from your house. There’s some more Domino’s in Chicago. Here’s some coupons.” Boom. Sold. Pizza came in 30 minutes, piping hot and delicious. On the flip side, I once found a bicycle I liked searching for “Chicago bike shop.” The issue? The store was in Bollingbrook! It ranked for Chicago terms anyway because its location wasn’t made clear on its landing page. Needless to say, I didn’t buy the company’s bike. So, how do you create the perfect local landing pages that lead customers to your business? Before you set out on your journey to create local landing pages, let’s throw back to Marketing 101. You probably remember the Four Ps—the granddaddy of all marketing theory and advice. The core of all marketing efforts comes down to what you offer. It doesn’t matter if your business is literally across the street from my house—if you can’t convince me that this product or service is something I need, something that is better than the alternatives, then I’m not going to buy. I need information about what exactly is being offered. Price can go a lot of different directions and isn’t always a necessary factor when it comes to making a sale. Take Digital Third Coast, for instance—we don’t have listed prices, because every project is custom built. But what we do emphasize is value. We focus on making the most of client budgets and focusing on ROI. You need to make it clear that the customer is getting value—be that by saving money, avoiding aggravation, saving time, whatever. Price isn’t always a matter of money. Once we’ve established our product and the value we provide, it becomes a matter of crafting the right message and delivering it to the right before through our marketing efforts. If you’re reading this, you’re well familiar with this concept already—we’re creating these pages so we can promote and drive traffic from Google. It goes without saying that if we’re talking about local pages, we need to make it very clear our location or area of service. Any good marketer will tell you that all four of these need to be well-defined and executed well in order to succeed. With that in mind, let’s dive into applying these principles to real life and talk about how you can create great pages for your local business. There’s three main types of pages we want to focus on when creating a local site. Each page has its own role in improving your local SEO results and driving PPC conversions. Home Page: An overview of everything your business does. Service Pages: An overview of a specific service or problem (i.e. “water heater replacement” in the case of a plumber). Location Pages: An overview of a specific area you service (i.e. :Wicker Park Plumber”). Make sure you DO NOT create pages specifying both a service AND location (i.e. “Water heater replacement Wicker Park”). These terms are so narrow, they tend to lead down a rabbit hole, necessitating dozens and dozens of pages with incredibly thin content that does not benefit the user. Focus on creating great Service and Location pages, and you’ll pull rank for the long-tail terms. 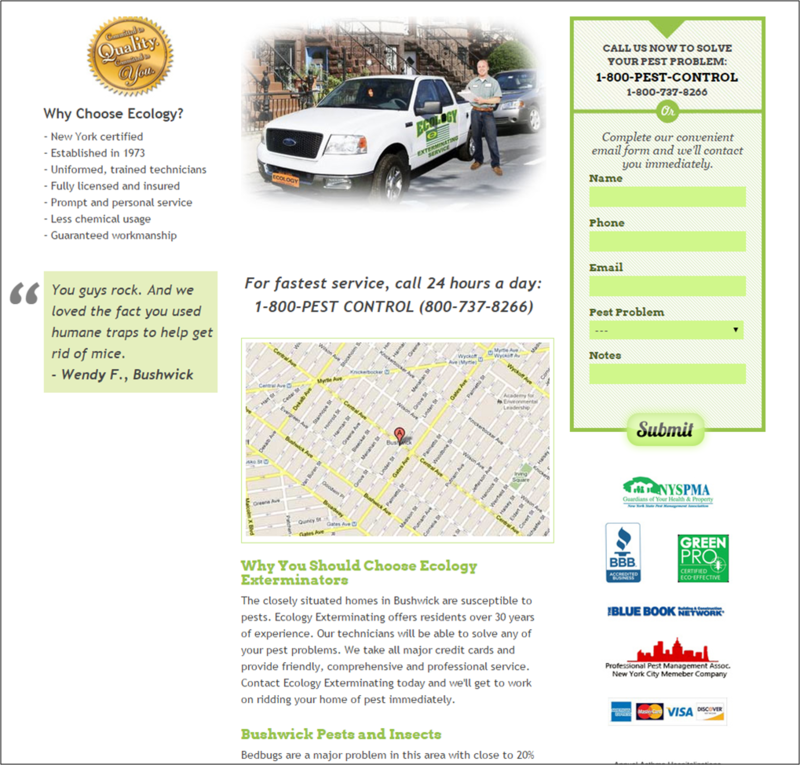 For this example I did a search for “Chicago plumber,” “pest control Brooklyn” and some other local key terms, and I found a few websites that embody the key principles of great local pages. None are perfect, but there’s a lot of companies that have the core ideas in place and thus, they rank well in these searches. This home page is very basic, but it gets so many of the basics right. They aren’t a large company by any stretch, much smaller than someone like Roto-Rooter, but they appeared above the national company in search results. Why? Area of service is very, very clear— “Chicago’s North Side and North Shore Neighborhoods” is the first thing we see on the page. The service map on the homepage makes it very easy to understand exactly where the company is offering its services. Page Contentmatters greatly for organic ranking. These guys have a few paragraphs of text, and there’s even more after the screenshot here gets cut off. They make use of key terms like “plumbing emergency” “water heater repair”—there’s no stuffing, there’s variety and relevance, and that drives organic results. Easy Navigation is a total blessing. Need emergency service right now? They have you covered. There’s a big button leading to a list of services and specialties that they offer. It’s a very basic website, but it’s very easy to navigate. And keep in mind with a lot of local services like plumbing, your customers might not be the most tech-saavy, and they’re more likely to be on mobile. Follow the principle of Don’t Make Me Think—a grade schooler should be able to understand how to interact with your site. With a BIG phone number in the top corner when the page loads, and you can schedule an appointment online instantly. Make yourself as easy as possible to get in touch with. There’s yet another form down the page. It’s a little bit excessive but as an analyst I’d rather see TOO many contact options, rather than making it hard for your customers to reach out to you. For what was likely a basic web design job on WordPress, this website covered a lot of the key elements by making its services clear, service area and location clear, and making it easy for visitors to get in touch with them. 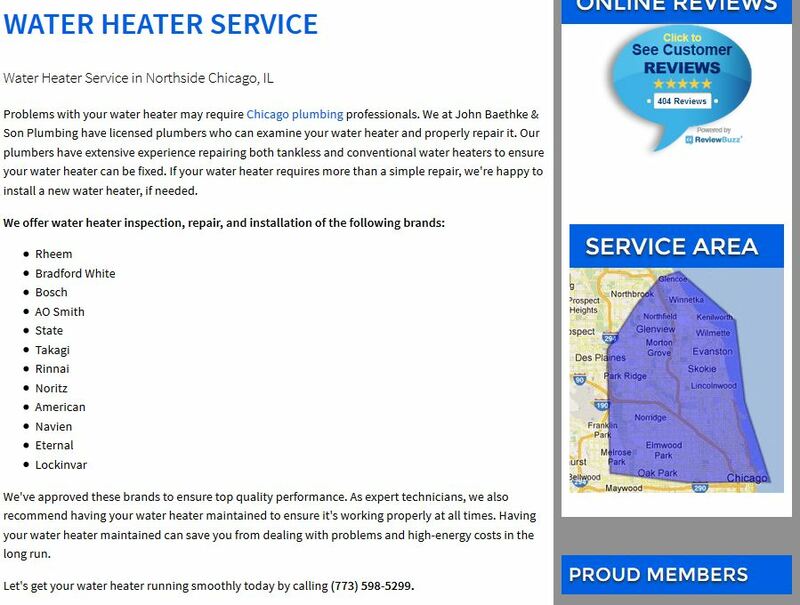 We once again reference our new plumbing friends with a pretty solid example of how to make a service-focused page—this one addresses the exciting world of water heaters! So why does this work? One of the key things when it comes to your service pages is showing people that you’re an expert on the given query. Here they make mention of both repairing existing heaters and installing new ones, as well as the ability to service both tankless and conventional heaters, while making it clear which brands they service. “Chicago plumbing,” “water heater repair,” it’s all there. There’s also a good number of words on the page, helping them to rank in organic search. And a phone number at the end. Perfect! Drive them to your sales team. They’re targeting Bushwick, a large neighborhood in Brooklyn. There’s information here that’s very specific to Bushwick (i.e. speaking about bed bugs, because those happen to be a particular issue that hits Bushwick moreso then a lot of neighborhoods.) Even a review on the page from a customer in Bushwick! So relevant! We very clearly see the area they’re referring to. If you service the whole town/neighborhood and some surrounding communities, you might want to use a service area map like the plumbing examples. There’s the major selling points, there’s some reviews on the page, there’s a large phone number and contact form—all things we called out earlier also apply to this page. Making great local pages can be time-consuming, but it’s not too hard if you approach it the right way! The home page needs to be broad and focus on the main area, with service pages showing expertise in providing that service and the location pages showing a history and knowledge of that particular area. Keep the classic four Ps in mind on each type of page. Make it clear what you’re offering and where you’re offering it at by fleshing out service and location pages that clearly target your customers. Clear contact information drives customers to convert. That’s the goal of all this promotion. Emphasize value—you don’t need to state a price, but think about your consumer and what they value most. Speak to their needs. Make it clear you not only operate in a certain area, but have a history of expertise in the given area. 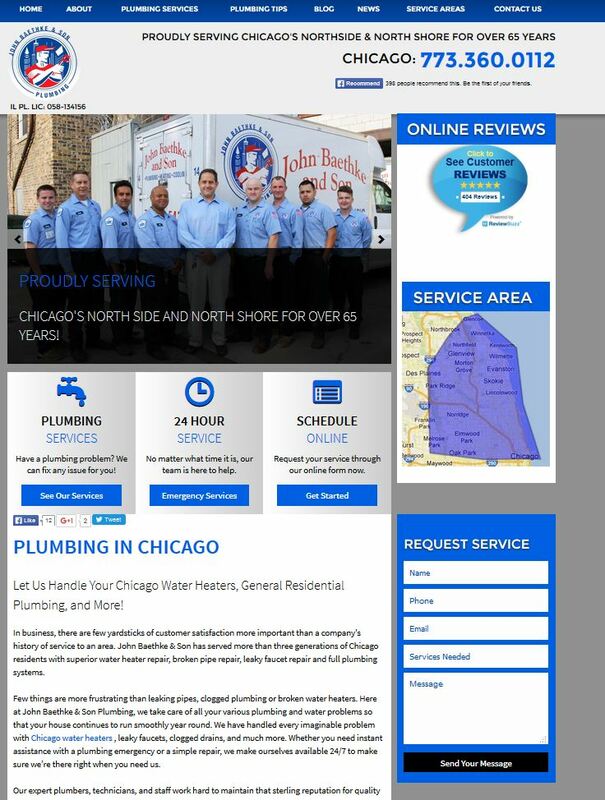 These examples should have you well on your way to creating great local landing pages, but if you’re curious to really step up the game and learn more, check out our Chicagoland Local SEO e-book, where we dive even deeper into how to make a great local site.